A concerned netizena and veteran professor lectured two of the most vocal critics of Pres. Rody Dutere on social media, investigative journalist Raissa Robles and former Presidential Spokesman of Aquino, Edwin Lacierda because they made fun of Pres. Duterte's Visayan accent. Aside from receiving tremendous amount of criticisms from netizens, a concerned professor identified as Assistant Professor Esmeraldo S. Bustillo Jr., from Western Mindanao State University criticized and lectured both Robles and Lacierda. Veteran author and self-confessed Dilawan Raissa Robles tweeted "Duterte just said that the communists are engaged in "armed stragol." 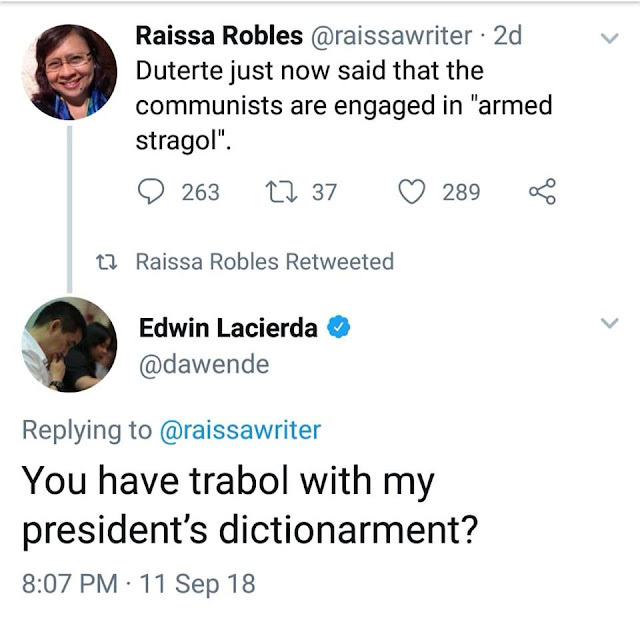 The statement of Robles was echoed by Edwin Lacierda who also mocked the President by saying "You have trabol with my president's dictionarment?" Lacierda tweeted. Due to the statement released by Lacierda and Robles, Prof. Bustillo lectured them and asked the two supporters of the opposition if they felt superior when they mocked Duterte's accent?" Prof. Bustillo pointed out that even people from first world countries were sometimes heavily accented when they spoke the English language like the Visayan people, so Robles and Lacierda should not make fun of it. Okay, so how about the French and the Germans, the Italians and the Russians, or the Spaniards and Portuguese? They are heavily accented too when they speak English, if they know English at all. Does it mean to say that you’ll also make fun of them? Are they now lower than the two of you simply because they cannot pronounce English words as perfectly as the two of you? You two are ill-mannered, and rude. But that is the common lot of you people out there. You are bigoted, you discriminate us from the provinces – especially us in Visayas and Mindanao – simply because we have a peculiar way of speaking the English language and that only you have all the right to be highly exalted. Edwin Lacierda already apologized for his statement as he noted that "To those who sincerely & genuinely found my poking fun at my own Visayan dialect offensive, I apologize. The president’s accent reminded me of a time when we were growing up in a Boholananon household. There was no intent to insult our dialect but it was culturally insensitive." Although Lacierda already apologized netizens particularly from the Visayas and Mindanao areas insists that the day of reckoning will come for Lacierda on his mocking of Pres. Duterte's way of speaking. Edwin Lacierda is considered as one of the senatorial bets of the Liberal Party in 2019.